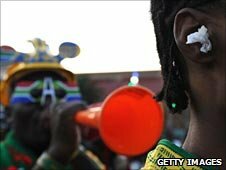 BBC News - Can you block out the blare of vuvuzelas? Can you block out the blare of vuvuzelas? The one-note drone of massed plastic horns is the soundtrack to the 2010 World Cup. There'll be no ban, so is it possible to block out over-vuvuzealous parping? Loud enough for you? The incessant drone of vuvuzelas blown from start to finish of a World Cup football match can reach 130 decibels - louder than a referee's whistle or a chainsaw at full rip. While those in the stadium can revel in the atmosphere - and perhaps invest in the "vuvu-stop" ear plugs reportedly selling like hot cakes - fans outside the Rainbow Nation can be less forgiving. On TV or on radio, it can at times be a struggle to hear the commentary, let alone the familiar singing, cheering and jeering from the crowd. Complaints ring out from bar-room and barbecue, social media site and radio phone-in. A vuvuzela is tuned - to use the term loosely - at the B flat below middle C, and has a similar frequency to speech tones, says Trevor Cox, president of the Institute of Acoustics. This makes it particularly tricky for broadcasters to tune out, as to do so would dampen the commentators' voices - and not in a good way. "I'm looking at its wave patterns and there are at least six very strong harmonics in there. It would sound really horrible to notch these out - if one coincides with the vowel sound e, you won't be able to hear the -es in the commentary. It would sound unnatural." To "notch out" is sound engineer speak for making a sound filter to block a certain frequency. 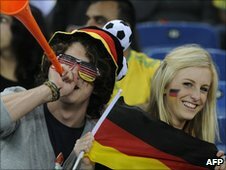 Various online vendors claim to sell vuvuzela filters - such as a 45-minute MP3 noise-cancelling track to play during each half - and a German computer programmer has posted instructions online - in German - for building your own using a soundcard-equipped computer and specialist software. But buyer beware, says Professor Cox. "It's physically impossible to play a sound to cancel out another sound coming from your television. It sounds constant, but the noise is too random to be cancelled out. How can they know when England will fail to make a save and the vuvuzelas will go even more crazy?" So while broadcasters cannot simply block these frequencies for fear of disrupting words of wisdom from John Motson et al, sound engineers have been advised to dip certain frequencies when the massed horns are a-blowing particularly loudly. "They can also change the balance between crowd noise and the commentary box, as these have separate mics. But they wouldn't want to take out the crowd noise completely, because then there'd be no atmosphere," says Mr Cox, who is also professor of acoustics at Salford University. The BBC has so far received 224 complaints about vuvuzela noise, a figure that may rise sharply once it broadcasts its England match (against Slovenia) next Wednesday. "We have already taken steps to minimise the noise and are continuing to monitor the situation," says a BBC spokeswoman. "If the vuvuzela continues to impact on audience enjoyment, we will look at what other options we can take to reduce the volume further." Fifa president Sepp Blatter says the vuvuzela is part of African footballing culture, and the organisers have ruled out a ban, instead urging fans to refrain from parping during national anthems and stadium announcements. But there is a silver lining. While insistent and incessant, a vuvuzela makes a dull sound free of the higher harmonics, which means it's not as piercing as it could be given its volume. "My advice? Get used to it - if you think it's annoying, you will get annoyed by it," says Mr Cox. "Embrace it, see it as a colourful part of the World Cup." And, failing that, there's always the mute button. The quirks of live subtitles can only add to the experience. This from someone who has actually attended a match. The vuvuzelas are not randomly played. On TV they sound like lots of unconnected sound but if you attend a match you will see the flow and ebb of the sounds based on the particular sections of the crowds support and loyalty. It's brilliant and it would spoil the atmosphere without one. If you want to watch a quiet game go watch cricket. Simply record the commentary and crowd noise on different channels. Filter the vuvuzela from the crowd channel and then re-combine them for broadcast. What's so difficult about that? Although the vuvuzela's lower harmonics overlap with those of the voice, the commentary is always substantially louder when broadcast - if vuvuzelas annoy you, it is because they are incessant rather than because they are loud (at least in the broadcast feed). As a consequence, you can in fact filter much of the vuvuzela sound without damaging voice quality too much, just by reducing these frequencies enough to drop the vuvuzela into the noise but leave the voice audible. Commentators sometimes start to sound a bit nasal, but it's not too bad. We've been looking at this in the Centre for Digital Music at Queen Mary, University of London. There's a problem, though. Although filtering out the lower harmonics makes the sound much quieter, the longer you listen to it the more it appears to return. After 10 minutes, it sounds pretty much like the unfiltered version again, because your brain is simply too good at extrapolating the sounds from the persistent higher harmonics. And as far as I can tell, you really can't filter the higher harmonics effectively without losing the crowd noise. So, Trevor Cox's advice ("embrace it") is probably wise. If (and it is a BIG if) the commentators are in boxes, rather than the stands, then surely the audio feeds from the pitch could be attenuated/filtered to remove the vuvuselas, and the commentary then added ON TOP of that. But if the commentators are in the stands, then forget it - we will just have to have a wasp in our ear for the remainder of the World Cup. Could the BBC provide a "red button" option where the ambient noise is lowered in volume and the commentators' voices are enhanced? I know this would mean rather less atmosphere, but the vuvuzelas are so irritating I would settle for that. Alternatively maybe we could have a "clean" commentary on a radio channel. I don't understand what all the fuss is about. Watching on TV I haven't found the vuvuzelas to be a problem at all, the sound is much quieter than the commentary and simply becomes part of the background crowd noise once you get used to it. I actually think it produces a pretty good atmosphere, better than some of the silent Premier League grounds in England and I'm glad the decision has been taken not to ban them. For those who are annoyed by it, lighten up! After being kept up til 1.30am on Sun (from midday) by some football/beer hyped neighbours, who had both a very loud karaoke PA system in the garden, and several vuvuzelas, I can't say I am particularly partial to them... Another neighbour gave his grandchildren some to blare early on Sunday morning. A small form of social justice/revenge, but I'd rather not be in the middle of it. I like the noise of the vuvuzela, it is very atmospheric. I have no problem hearing the commentary from Five Live on medium wave. Why not take the commentary, put it through a frequency doubler, a la Chipmunks, filter out the vuvuzela sounds from the crowd noise, then reduce the commentary frequency and add it back in? They're annoying, they take away they rise and fall of the football match, the OOOOHs and AAAAHs. I note that there are microphones all round the match pitches; can't the sound man compensate a little and put more emphasis on crowd sections without these blasted things? If it is a constant note then surely erecting a massive speaker broadcasting the same note in reversed amplitude will counteract it and make it virtually disappear. Same prinicipal as in cockpits and noise cancelling equipment. But then all it will take is the next generation of vuvuzela, a few hundred Hz off frequency for this expensive equipment to be rendered useless... even worse this will then be heard to make a loud noise of its own with nothing to cancel it out. More importantly though, is there a way to cancel out the moans of the massed ranks of vuvuzela haters? Come on people, get with the atmosphere of the World Cup on African soil. The sound adds to the whole experience. Vuvuzelas are making this World Cup a joy to remember and it's barely even started. Keep on parping - PARP! PARP! PARP! I can't wait until next season, when the vuvuzela becomes a phenomenon of our own football leagues - as with the spread of the Mexican wave, ole football and the minute's applause, so with the vuvuzela. BLAAAAAAAAAAAAAAAAAAAAAAAAAAAAAAAAAAAAAAARRRRRRRRRRRRRRRRRRRRRRRRRRRRRRRR! Why not just run some stock crowd noise from a completely different international in the background (no vuvuzelas of course) and hope nobody notices. Surely the BBC sound engineers could reduce the volume of the general crowd noise - vuvuzelas included, and overlay some generic crowd chatter recorded at some European game. That would make things more pleasant for the listener, while not completely removing the vuvuzela sound. Is it possible to do a sound commentary from within a sound-proof room with a view? The vuvuzela destroys an inherent part of the football experience, the excitement and the tension in the crowd. Great goals, near misses, bad tackles all have their own noises. The crowd is a big and essential part of any sporting event. In South Africa, this is not true, and the tournament will be remembered as the World Cup lacking atmosphere. I suffer from tinnitus and vuvzelas are making my hearing worse. I wake up with severe pain and noise in my ears after watching a match the night before. I now turn the sound off, but this spoils the fun, so I for one will not watch any more matches (apart from England).